A double mattress on the carpet, two cocker spaniels, a farting dalmation, and me. Or more precisely, a dissolving puddle of me, in tears on the floor, six months pregnant with my first baby. And the picture above is the place where it all happened, way back in 1988. The Old Officer’s Mess, Prinsloo Street, Ladbrand, South Africa. Outside in the garden, the auctioneer’s hammer clicked decisively against a wooden block every few minutes as yet another piece of antique furniture or much loved piece of bric-a-brac found a new and excited owner. Excited mostly because there was no reserve price on anything, and everything was going for a song. The unique, carved, circular dining table and chairs we’d bought from an artisan under an Umbrella tree in Namibia had just gone under the hammer. And each time I heard that doom laden clack I winced as a fresh spurt of tears cascaded onto my enormous belly. I was crying not because we were financially insolvent and needed to sell everything, but because at the very height of my maternal cocooning process we were disbanding our home. At a stage when my hormones were going completely haywire my adventuresome spirit stood little chance at winning any inner debate. This time we were bound for the mountain kingdom of Nepal where Dave had accepted a job as a geologist on a project rehabilitating the Mugling to Pokhara highway. Our much loved home, the sandstone, Old Officer’s Mess in Ladybrand, Orange Free State, South Africa would be sold and our household effects would not be coming with us to Kathmandu. This was a time of loss, before I could recalibrate and start to count my blessings again, while Dave was both staunch and strong, leading from the front. I was wobbling, but that is an understatement, in fact as the tears streamed down my face and I hugged our dogs, Bonnie, Clyde and Jasper close to my chest, I wondered glumly if the growing bump might perhaps be a litter of cocker spaniels rather than a baby. On the one hand I was delighted to be pregnant, and couldn’t wait for the imminent birth, but in reality I knew practically nothing about babies and had paid scant notice of anyone else’s babies. On the other hand, I knew a lot about puppies. So to redress the situation I was in the process of reading a gushy book about pregnancy and babies. The book didn’t mention how you would feel in a hormone rush when having to pack up home and leave behind your first substitute babies – the puppies that had turned into dogs. It was November 1988. FW de Klerk had become the 9th State president of South Africa, and apartheid prevailed. International sanctions were in place too, while bombs and explosions were part of the ANC armed struggle – one at a service station in Cape Town, another in Woodstock, others on the beachfront in Durban and in Johannesburg. Our own little world seemed to be imploding. South Africa was not, if you had any social conscience, a pretty place to be, but like many others at that time, I’d managed to remain ostrich-like in my home in Ladybrand content with my divine spouse, my spaniels and a vegetable garden that sprouted courgettes like triffids, courtesy of our haphazard gardener. We lived a fairly basic and eccentric existence, happy in our castle of sorts with its mismatched contents, and happy with a reasonably simple life doting on dogs, enjoying braais (barbecues) and beers with friends and bush walking in the mountains of Lesotho nearby. In many ways though, South Africa was in turmoil, and although we loved the country and the people, we felt there was a real possibility of getting stuck in a political rut. With a baby on the way our life was about to change, and an interesting job offer in Nepal on the table meant that we’d been offered a one way ticket out. Little did we know that the ticket would be a rollercoaster ride which returned us to the African continent on not one, but two future occasions. One of the hardest things about moving country is leaving friends and family behind, but then your heart is wrenched again when it comes to your pet dogs. 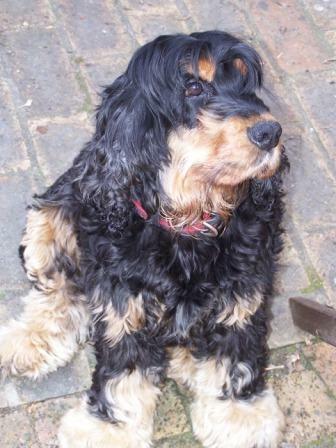 Some of ours have have made the trip, Charlie the cocker spaniel for instance had his ticket booked from England to South Africa before any of our tickets were paid for, but other dogs due to considerations such as age, or long periods of quarantine didn’t make it to the terminals. I have cried hopelessly many times, and been in the trough of despair for months afterwards as I mourned the loss of yet another dog. Here are some of the dogs we’ve had the pleasure to look after in England, South Africa, Lesotho and the Philippines. All of them were given to loving homes when we left. This is Charlie, the cocker spaniel who came with us to Africa. 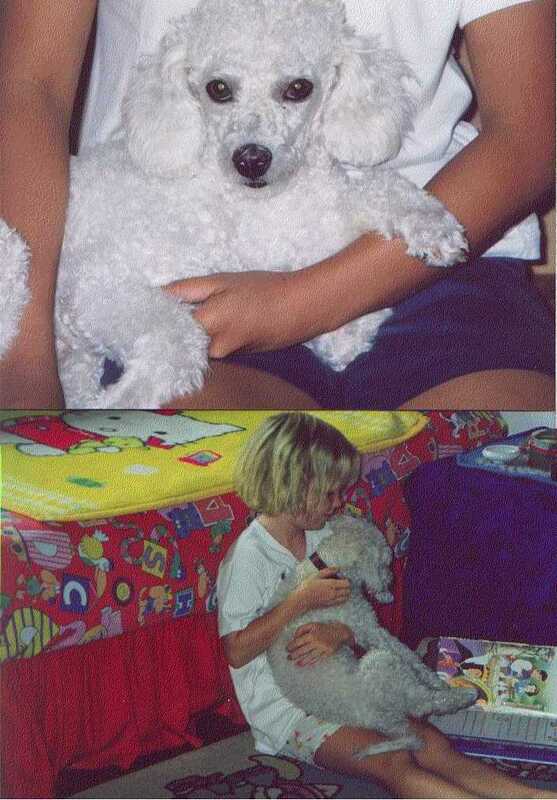 He was a loyal, fluffy, cuddly dog who used to say “Hello”. Sadly we considered he was too old to move with us to Australia, where he would have faced over six months’ quarantine. Matty arrived on our doorstep one day in Manila, The Philippines. He was matted and dirty, bony and covered with fleas and ticks. We left him for dead with a bowl of water and some food, but in the morning he adopted us. I wrote and self published a humorous childrens’ novel about him. 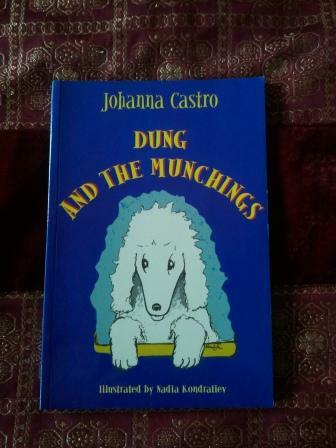 He was so disgustingly filthy when he arrived that his name in the book became “Dung” although by the time I wrote the book he was a much loved pearly white little poodle. 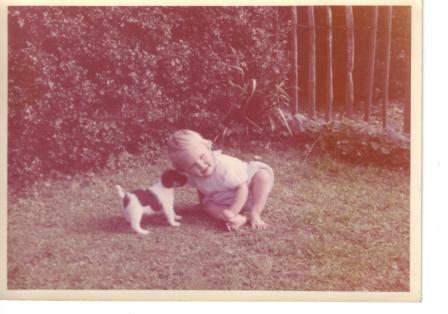 Even as a baby I was a dog lover! This I believe was taken in my grandmother’s garden near Eastleigh in Hampshire where she had a Victorian house called Hillcroft. We always had dogs when I was growing up. Then there was Spotty – who didn’t have a single spot. 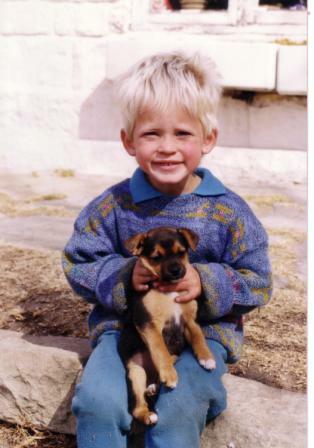 She came from a RSPCA centre near Bloemfontein and was a present for Sam who had just had to have a small operation at the time. When he woke up from the anaesthetic, he had Spotty on his lap. She was a faithful little thing but learnt to ‘pronk’ like a Gazelle, leaping over our fence when she wanted to get out. Bonnie and Clyde were Cocker Spaniel cross breeds and Jasper was a dalmation – very handsome but he had the dubious propensity of farting loudly and often! All these three dogs we had to leave behind because we were heading for the Himalayas, although friends who adopted Clyde said that he would escape and run a couple of kilometres back to our gate in Ladybrand (on the border of Lesotho) looking for me, for quite a few months afterwards. Clyde was the first ‘person’ to know that I was pregnant with our son because when I was about a month ‘with child’ he would lie against my tummy when I sat down and growl everytime anyone came close to me. Now I am a doting doggie grandparent because my son and his girlfriend have just bought a puppy. 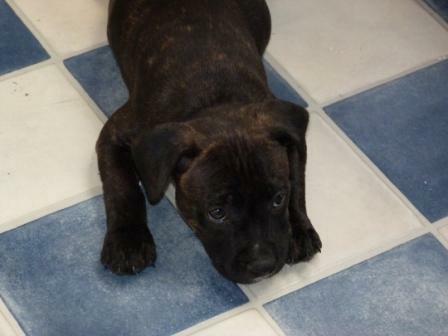 Meet Rhino, a gorgeous Staffie, who is sure to be spoilt to bits. Yes, life has come full circle once again. I am a very happy dog-gran! Which dogs have you had to leave behind in order to travel? it made me cry just reading about it! They were all lovely in their own way, and do get under your skin, don’t they? My heart went out to you. Having to sell everything and leave your beautiful dogs would have been so hard. Congratulations on being a grandma! Thanks for commenting, Jenny. Yes, our travelling life, with its many moves has been full of yin and yang, but I’m very happy to now be a dog-gran! So sad. I know how hard it must have been. I can’t imagine being without Riley now. At least you know they went to good families. Duchess went to a fantastic home with 2 other dogs when we moved to the UK. Now we are back in South Africa her new mum and I take them all for walks. Duchess remembered me and gave me a great welcome, but I could see the cogs in the brain going “hang on a sec, I don’t have to go back to her, do I?” and she makes very sure she is first dog into her new mum’s car when we finish. I’m so glad Duchess went to a fab home, that you can go for walks with her, and that she’s so happy with her new owners. It’s quite sad when they act as you said, but it’s also reassuring isn’t it? I can remember Bonnie and Clyde jumping into the back of their new owner’s bakkie when we visited them after a couple of years. Clyde also gave me the “I know you – you weren’t too bad” welcome, before happily saying goodbye! We have been traveling with our French Bulldog Chucky all over. We got her in Berlin moved to Ireland then Valencia, Spain. Then we started our travel blog and we took her with us to Oviedo, Spain – Savannah and then Buenos Aires. Our next stop then Bolivia and we decided that would be a little much for her and decided to send her to my mom in Germany. Where she stayed 3 month. 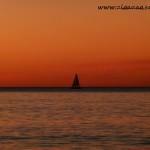 We picked her up again to stay with us in our break month in Valencia (which is also our HQ) then took her to Sicily. Now we are flying with her to the US, where she is going to stay with Mike’s parents for 6 MONTH!!! So sad but taking her to Asia would be horrible for her. Can’t imagine to be without her for such a long time! And I know when we come back she is not going to look at us for 3 weeks or something! Thanks for popping by Ingrid. how heart-breaking it must be to make a home, accumulate treasure bought in far flung places of the world and then sell them all – it reminds me of Karen in “Out of Africa”. But these are just “things” not like the dogs you take into your hearts, who become family and then… but life goes on…..
Another great chapter for your book Jo! 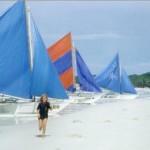 Thanks for commenting Jill, and your reminder about Out of Africa. Now that was a heart wrenching movie/book/story! I’m not sure if I’ll be able to replicate that in my memoir. Leaving dogs behind has been one of the hardest things about our itinerant lifestyle. I often look at those pictures of them and tears just well up 🙁 BTW I very much enjoyed your recent post Western Australia’s amazing wildflowers.